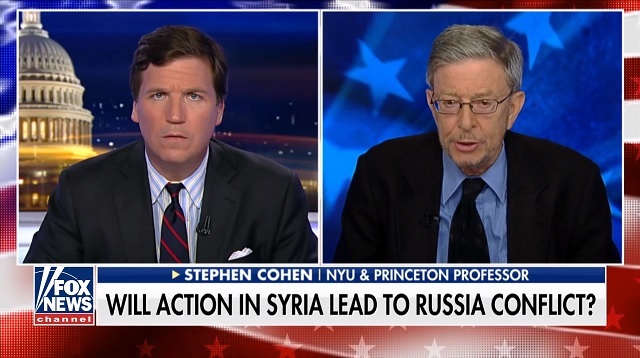 Professor emeritus of Russian studies at Princeton University and New York University Stephen Cohen told Tucker Carlson Thursday night he's "more worried" than he's "ever been" at the prospect of nuclear war with Russia. "If Russians die, if Damascus is attacked (the capital of Syria), Russia will retaliate with its excellent weapons, every bit as good as ours…some people say in some regards the missile technology better," Cohen said. "Russia will strike, Americans in Syria will die," he said. "We will be where we have never, ever, ever been with Russia, killing each other…bearing in mind that both nations are laden with Nuclear weapons," Cohen continued.